Thanks for stopping by my blog! In this post I wanted to share my thoughts on Sigma Beauty's latest launch- the limited edition Creme de Couture collection which was sent to me for review. It consists of a 16-shade eyeshadow palette and 3 powder blushes... and it's all inspired by french macarons! The packaging really couldn't be cuter. I love the pastel colors and the ultra-feminine look of everything. It's sort of a cardboard style packaging, and the lids just lift off. It's all very slim and there's not a lot of excess bulk, which is nice. And just so you know, the shadow palette itself is $32, the blushes are $12 each, and the whole collection is $55 ($78 value) at SigmaBeauty.com. An interesting aspect of this collection is that the eyeshadow palette is entirely matte and so are the blushes! No shimmer here. You're getting a pastel pink blush, a deep coral, and a lavender. Blushes from left to right: Strawberry Ambrosia, Cherry Apple, and Blackberry Essence. (These swatches are much more concentrated than the way you would apply them on the cheeks). While all of the blushes look adorable, and they're all very smooth and pigmented... there's only one that I really like the looks of on my skin and that's Cherry Apple. It's a very flattering color, and I love the color payoff- you don't have to use a lot to get the look that you want. Strawberry Ambrosia just seems a little to light for me- I prefer blushes to have a bit more color. Maybe people with super fair skin would like that color more? Blackberry Essence kind of confuses me... I've never really had a desire to use a blush with purple tones and I just don't think it does anything for my overall complexion. 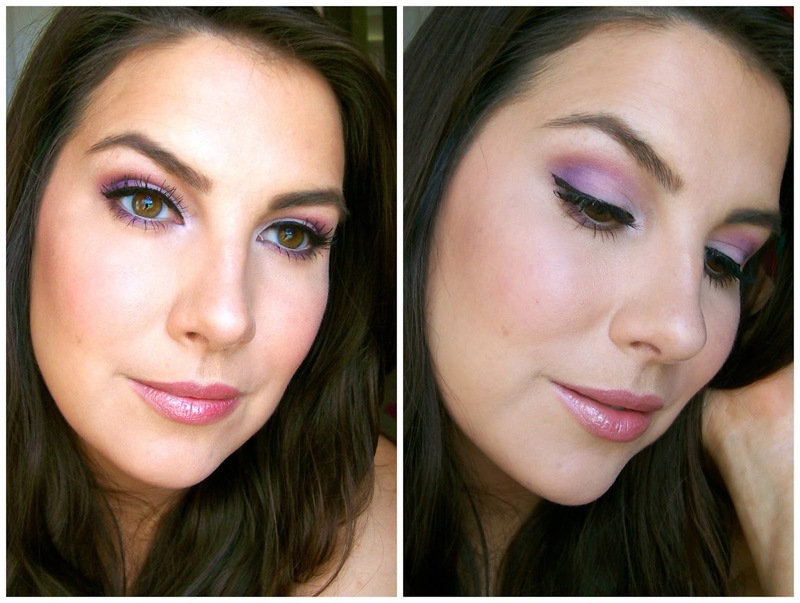 Have you used a lilac blush before? Do you have any tricks for making it look its best? Now here's the shadow palette! I am extremely impressed! These are so buttery smooth and the whole palette is very consistent. I haven't noticed a "dud" shade or one that doesn't go on as well as the others. Sometimes brands seem to be able to pull off deeper matte tones, while the lighter mattes are chalky and dry. However in this collection- even the lightest shades (the pastel pink, lilac, and yellow) come off just a smooth and rich as the darker and brighter colors. These aren't super dry and flaky either... I don't notice tons of fallout when I dip my brush into the colors. When I first opened up the palette, I was kind of bummed that there wasn't a light creamy shade to use as a highlight... however I've found that a sheer wash of the light pink works quite well under the brow without looking TOO pink. Here are some swatches! (no primer used underneath). Top row: Redberry Rose, Apricot Flower, Passion Fruit, and Cherry Blossom. Second row: Meyer Lemon, Ginger Pumpkin, Cafe au Lait, and Blueberry Cream. Top row: Violet Whip, Lavender Honey, Cassis, and Elderberry. Second row: Blue Chocolat, Almond Pear, Creme de Menthe, and Citron Pistachio. My favorite shades are Redberry Rose (hot pink-- so bold! ), Passion Fruit (gorgeous mauve/pink- great for blending out other colors), Cafe au Lait (a classic brown- fun to pair with some of the brighter shades), Lavender Honey (pastel yet bright- so beautiful), and Almond Pear (great mint green- I don't have many shadows in this color). The eye irritation that I mentioned yesterday has totally died down. Thank goodness! Cupcake is napping on a towel in the bathroom. By the way, her new thing is getting in the bathtub, hoping for Tyler or I to turn on a stream of water so she can watch it. Too funny! Time to do some chores... have a good afternoon! I think I prefer the look of the creme blushers (totally loving creme blushers right now!) to the palette, the palette looks nice, but there's a lot of colours there that I just wouldn't wear. Just so you know-- those are powder blushes. I should have clarified that in my post- sorry about that! I like the blushes, not too crazy about the Palette, too bright, and they are spring colors. Love your channel and love your blog, I've been a makeup artist for a decade but now I'm starting in the swing of social media. I'm working on my youtube channel, I also have a blog and tumblr. I'm gonna try to order this through the website since I live in Canada and will love to show you or maybe one day send you some makeup samples from two Canadian Cosmetic Companies which are QUO cosmetics and Faces Cosmetics... take care and keep up the good work! Oh, and I actually really like the look of the lilac shade blush. If I were to get a shade of blush from this collection, that would be it. Is this collection LE? Great swatches, thank you!! My skintone is so fair (is "translucent" a color?) and has pinky undertones, and oddly enough, the blushes that look purply, while not the ones I find myself attracted to when shopping, are always the ones that look weirdly great on me. This colours are so bright! Love what you have created using them though! I need this♡♥ great review! These are beautiful! Definitely on my wish list! I love those pastel colours in that palette. You are really good at picking out wearable colours to review (and that blush in "Cherry Apple" looks delicious). This looks like such a pretty set. I just love the variety of fun colours! In a way, I think this concept would definitely fly off the shelves 5 months or so ago. The macaroon trend in makeup is pretty last season, in my opinion. But the colors and packaging are still pretty! That eye palette looks kind of scary at first but looking closely there are some really beautiful shades there that would create SO many different looks! My cat Whitey Jackson likes to sit in the bowl of the bathroom sink and lay around the drain and I turn the faucet on and it hits the center of the sink and she just leans in to lick..this can go on for 10 minutes and since I'm a stupid human I stand there and think she's brilliant - good lord the cat owns me. I have also bought it after seeing it at MakeupByTiffany's blog. I haven't tried them yet, but I am looking forward to it. I am glad you already made a tutorial. I love the look of the palette, but even your swatches look chalky. Could you tell me a bit more why you consider the palette to be pigmented but the end result of the swatches appears to be pretty poor quality? I only asked because this looks like something I'd love but you're not the first to show chalky swatches and I just don't get it! Libby wants to drink in the bathtub too. I have a little bowl setting in there for her because I don't want her to lick the tub! A bit surprised that Sigma released this now, when everything else is coming out targeted toward fall. Not a super huge fan of the colors as I am more of a neutrals person but I do like the look of that candy apple Blush. I think this collection is a miss for me though. I will stick to my Sigma Brush and Resort Palette addiction for now. That palette looks super fun! I would love to try the Cherry Apple blush. But a brush kit must come first! I want the Mr Bunny travel set so badly! This collections looks very impressive! • Coupon is not valid with or in conjunction with any other promos and discounts. • Unlimited number of coupons may be purchased. • Please provide your coupon code when you make a reservation and present your printed coupon together with a government issued ID upon arrival at the establishment. Face, eye and underarm treatments is one of the best solution in our modern technology. Fast effectiveness with the help of the eight featured beauty treatment at ORTIZ SPA AND AESTHETIC CARE . Like Cavitation Ultrasound revolutionizes the treatment against cellulites and fat. It is a non invasive based on sound waves which generates empty micro bubbles in the liquid situated in the interior of the adipose tissue and Galvanic with vit C infusion treatments, through a gentle massaging action, help to focus cellular energy and enhance circulation. And also the removal of toxins and impurities. ORTIZ SPA AND AESTHETIC CARE the spa that act of making something more beautiful as you, for only P99 instead off up to P2,500 for any of the eight (8) featured beauty treatment. Hi....Friends Its amazing for everyone Bulk Liquid Packaging Manufacturer Canada provides many offers. A duplicate of the invoice will certainly be emailed to your signed up email. ParentPay Login these as well as to maintain them risk-free and also safe.